A dark and dim movie presentation can ruin the experience for your audience. It is vital you understand the life expectancy of each projection illumination technology to best choose which one is best for your theatre. For DCI compliancy, your projector must achieve at least 14fL in order to play cinema quality. Xenon and laser phosphor both use a replaceable light source in order to reach eight years of projection use. RGB pure laser will maintain brightness without component replacement. The graph below compares brightness drop-off of the different illumination platforms over 30,000 hours (around eight years for a typical cinema projector). 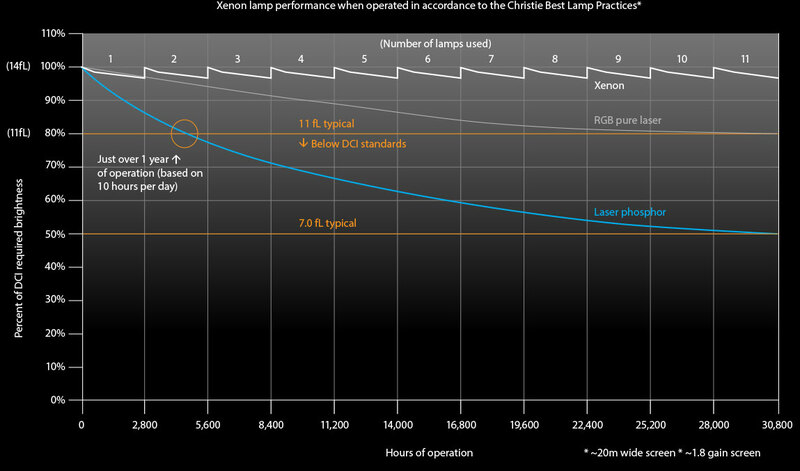 Xenon bulbs burn out the quickest, but are also the most affordable to replace. Laser phosphor light modules will last a little more than a year, but need to be sent back to the factory for replacement. RGB pure laser maintains 80% of brightness over 30,000 hours (eight years) of use.